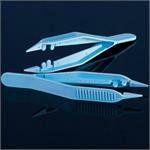 Medical-quality tweezers with serrated tips for hobbyiests, salons, and first aid kits. 4-7/8" long and easy to handle. Also called Thumb Forceps or Dressing Forceps.